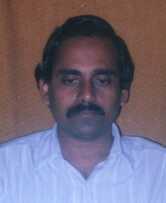 Palanad Divakaran was born on Dec 15, 1953 in Palanat Mana, in Malappuram District. His father is P.M. Neelkandhan Namboodiri, is an artist specialised in drawing, painting and music. He learned kathakali music from the famous teacher Late Kalamandalam Unnikrishna Kurup after the completion of his BA and BEd. And learned Carnatic music from Mr Krishnan Nair and Mr G.P. Govinda Pisharody. Kalamandalam Unnikrishna Kurup taught him kathakali music in 'Gurukula' type. At that time Kalamandalam Unnikrishna Kurup was the teacher of P.S.V. Natyasangham, Kottakkal. 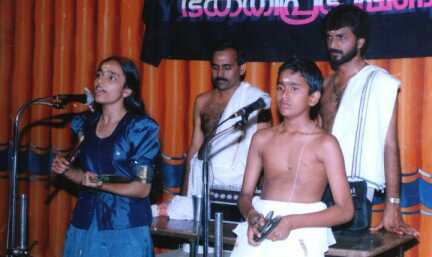 His first performance was held on May, 1980, conducted in their own Temple (Chelakkad Temple). The music of the story staged was Kuchelavritham'. Has participated Kathakali performance in many stages all around India and in foreign countries namely, London, Dubai and Hongkong. Now he is working as high school assistant (Sanskrit) in Govt Higher Secondary School, Pulamanthole. Family: Wife Mrs. Sudha, is an admirer and wellwisher of music Kathakali etc. One daughter Deepa, studying 1st BSc and practicing carnatic and kathakali music. She was 1st prize winner in Kathakali music in state youth festival for 2 times. And she was rewarded CCRT Scholarship for Kathakali music. And one son Sudeep, studying in 8th, also practising carnatic and kathakali music and also rewarded CCRT Scholarship. Deepa and Sudeep had their 1st stage performance in Kathakali at Guruvayoor in the last year, in the story 'Kuchelavritham'. Now they are performing Kathakalipadakacheri.